A report in the LA Times last week explored why farmers in the Central Valley are having a hard time finding enough workers, despite reportedly paying up to 40 percent more than the California minimum wage. “Today, farmworkers in the state earn about $30,000 a year if they work full time—about half the overall average pay in California,” notes the Times. “Most work fewer hours.” The second sentence here is key: most farmworkers are not employed 40 hours a week 52 weeks a year, so most earn far less than $30,000 per year. In fact, in 2015, workers who received their primary earnings from agricultural employers earned an average of $17,500—less than 60 percent of the average annual wage of a full-time equivalent (FTE) worker in California. Many farmworkers are paid an hourly rate higher than California’s minimum wage—$10.00 or $10.50 an hour in 2017, depending on whether the employer has 25 or less, or 26 or more employees, respectively—and workers who are paid piece rates, which reflect how much they pick or prune, often earn $12 to $14 an hour. Many young male farmworkers aim to earn $100 a day, which is $12.50 an hour for an eight-hour day and $14.30 an hour for a seven-hour day. But farmworkers typically are not employed in agriculture year-round. Many farm jobs are seasonal, and few workers migrate between California farming regions—those who pick vegetables in southern California deserts between January and May rarely move to the San Joaquin Valley to pick fruit between July and September. Note: All wages shown are in 2015 dollars. Source: Quarterly Census of Employment and Wages (Bureau of Labor Statistics, U.S. Department of Labor), https://www.bls.gov/cew, and special tabulations provided to the authors by CA Employment Development Department (March 7, 2017). So what’s behind the “about $30,000 a year” for a farmworker’s annual pay? Employers report employment and wages when they pay unemployment insurance taxes, and these data are published as the Quarterly Census of Employment and Wages (QCEW). According to the QCEW, 16,400 California agricultural establishments employed an average of 421,300 workers during 2015 and paid them $12.8 billion, or $30,300 per year for a FTE employee, equivalent to $14.60 an hour for 2,080 hours of work. However, the QCEW grossly undercounts the number of agricultural employees and therefore overstates the pay per employee. The average employment measurement in the QCEW accounts for workers on the payroll for the payroll period that includes the 12th day of the month. Most farmworkers are paid weekly, so employment covers workers employed for the second week of the month. However, employers report wages for all workers who were hired during the month, including those employed at the beginning and end of the month—even if they weren’t employed during the payroll period covering the 12th day. 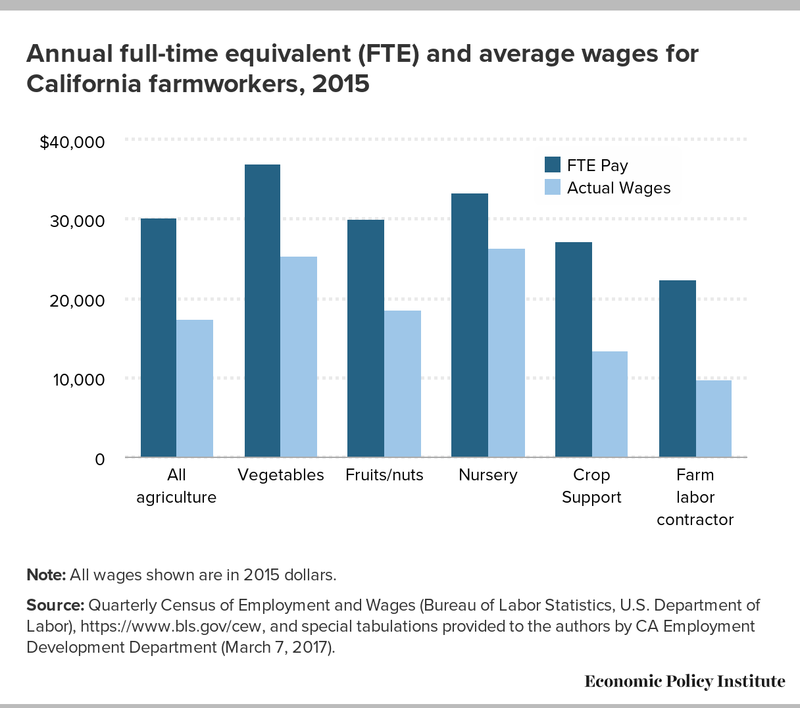 Dividing total wages by average employment in California agriculture reported in the QCEW generates the $30,300 earnings of an FTE employee. The California Employment Development Department extracted all Social Security Numbers (SSNs) reported by agricultural establishments and found 848,000 unique SSNs in 2015, which, compared with the 421,300 workers reported by the QCEW, means there were an average of two workers per FTE farm job. We assigned workers to the commodity or North American Industry Classification System (NAICS) code in which they had their maximum earnings, and found that 705,000 had their highest earnings in agriculture. Their average earnings were $17,500—just over half of the FTE average. The gap between average FTE earnings and actual earnings for farmworkers is widest for the grouping with the largest number of workers: those employed by FLCs. In 2015, an average worker employed by an FLC full-time and year-round for 2,080 hours would have earned $22,500 or $10.80 an hour. In fact, the average annual earnings of the almost 300,000 FLC employees were less than $10,000, suggesting just under $10 an hour for 1,000 hours of work. When thinking about and analyzing the wages of farmworkers, it’s of the utmost importance to consider what they’re actually paid—not what they would earn if they worked full-time year-round, since very few of them do.